I am happy to announce two new enhancements to the HuTerra fundraising platform that just came out this weekend. These enhancements will increase the reach of social sharing for the nonprofits and team supporters that use HuTerra for crowd fundraising. 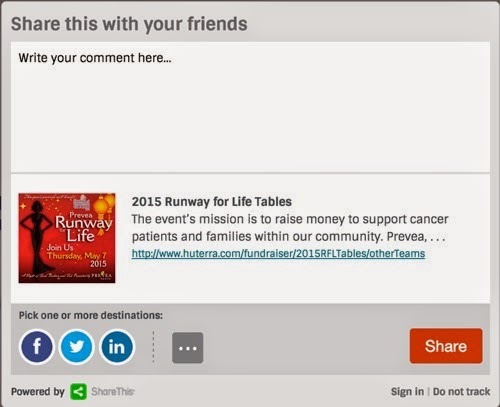 We started by first improving the overall social sharing experience for fundraisers and organization within HuTerra. We made the sharing links and buttons more prominent for users and removed the need to be logged into HuTerra in order to share with your friends and other team supporters. Never before has the HuTerra user experience supported so many networks in a simple to use interface powered by ShareThis. The social sharing interface supports not only Facebook and Twitter, but also Google+, LinkedIn, Pinterest, email, and over 60 other popular services. 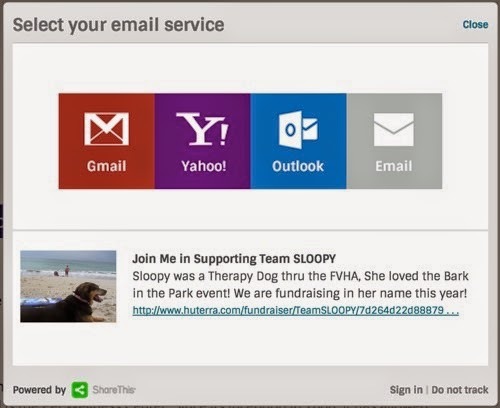 We also enhanced the email invitation process to help generate more direct support for a fundraiser. Users can securely invite friends to be involved using their desktop mail client, GMail, Yahoo mail, or Outlook.com mail. The generated email provides a basic template that can be customized by the user before sending to their friends, family, and fellow supporters. Our team continues to work hard to provide free tools that help nonprofits be more effective and efficient in supporting the causes they are passionate about. Please checkout the new features and leave us feedback below or on HuTerra's website. I am the Project Coordinator. I assist in the day-to-day activities for HuTerra Sports Management to ensure that projects move forward and are kept on track. I also make sure both clients and internal staff are informed and updated about the progress of projects. I have been here for just about two months. I like that I work with incredible people to solve daily challenges. I am the Platform Architect. I make sure everyone has an understanding of our products and I manage and maintain their development. I also identify any legal or technical risks we may run into. I have been here for just under two years. I have worked on the development of our fundraising platform and the development of Shop HuTerra. I also oversaw the development of our mobile and web games. I enjoy being able to problem solve. I am the Director of Finance and Compliance. I handle all of the company’s accounting needs as well as perform administrative and legal tasks. I helped set up a system for automated donations and settlement process for nonprofits. I have also worked on product fundraising initiatives. I like knowing that we are helping nonprofits generate additional revenue streams. It feels good to know that we are helping those in need. I also like the variety I experience every day. I am an IT Consultant. I manage the back-end of our website that tracks donations and is responsible for cutting Nonprofit Organizations’ checks. I also work on the Charity Services websites, for organizations like Habitat for Humanity and HOOAH. I have been with HuTerra for just under a year and a half. I have worked with Okanjo, product fundraisers and automated the payment process by connecting HuTerra to QuickBooks. I have also worked on a major version upgrade on the platform for our charity services. I like knowing that we’re helping people and that we are expanding the exposure market for nonprofits. I am the Director of Charity Services. I work primarily with Habitat for Humanity, adding new websites and attending conferences at which I present and talk with members of Habitat affiliates. I have been with HuTerra since its start, about 3 years ago. In addition to Habitat for Humanity, I have worked on many projects under ZyQuest. I was one of the founders of ZyTax and helped build the team that traveled to different oil companies. I really like that I am helping to build something for the future. I also like that with HuTerra we are making a difference for people who have a need.